OK, I know a little. So I know enough to know that I don't know a lot, although for now I know enough. But like most, I don't know what I don't know. You know what I mean? Oh no! I. It was quite early on when I learned to say "I know" (我知道)(wǒ zhīdào). That was easy. And 'not knowing' was almost just as easy: 我不知道 (wǒ bù zhīdào). II. It took a little longer to be able to say "I know everything": 我什么都知道 (wǒ shénme dōu zhīdào). Of course I didn't actually know everything, but even *I* could memorise that sentence. Yet that sentence bothered me! You see people told me that Mandarin was just like English: subject-verb-object. I eat fish. I photograph people. I know everything. But look at the sentence above: (我)(什么都)(知道): (I)(everything)(know). So much for Mandarin being just like English. Sigh. And I'm sure that someone will be able to explain to me why the above still is consistent with English, by referring to compound verbs, adverbial phrases, the genetive case, or even transferred epithets. But I'm not a linguist, I'm just someone struggling to learn Chinese. And to me, Mandarin is not like English. III. So imagine how frustrated I became when I realised that basically I know nothing. "I know nothing" 我什么都不知道 (wǒ shénme dōu bù zhīdào). Breaking the sentence down, it looks like this: (I)(everything)(don't know). My mind translated this as "I do not know everything" - which did not match the actual meaning. My mind was blown: I didn't even know how to know nothing! Let me just make sure you're following me. In English, if I know everyone in my street, then this means I know every single person who lives on my street. And if I know no-one on my street, then the number of people I know is zero. Not one. However when I say I do not know everyone, what I mean is that I know some people, but not all people. So the Chinese version 我什么都不知道 (wǒ shénme dōu bù zhīdào) didn't make sense to me - because it seems to relate to knowing nothing, rather than not knowing everything. Very different! But this wasn't the time for logic. 我什么都不知道 (wǒ shénme dōu bù zhīdào) means "I know nothing". Memorise it. And I did. With all due respect to the Chinese language, this feels really clumsy! Item IV is logical I guess, but it's not simple and it's certainly not obvious. Oh but it works. And as I keep reminding myself, this is Chinese. I can disagree as much as I want, but if this is it, then this is what I'll learn. Apologies: I'm too scared to re-read this post before I press [publish]. I'm worried I'm going be so confused by my own confusion, that I'll just end up clicking [discard] and blame it on the entropy of the universe. Maybe you started reading this post believing that although you didn't know everything, you didn't 'know nothing'. But now you know for sure that you don't know what I thought you should know. But don't blame me. No! What you need to know is it's not my fault. 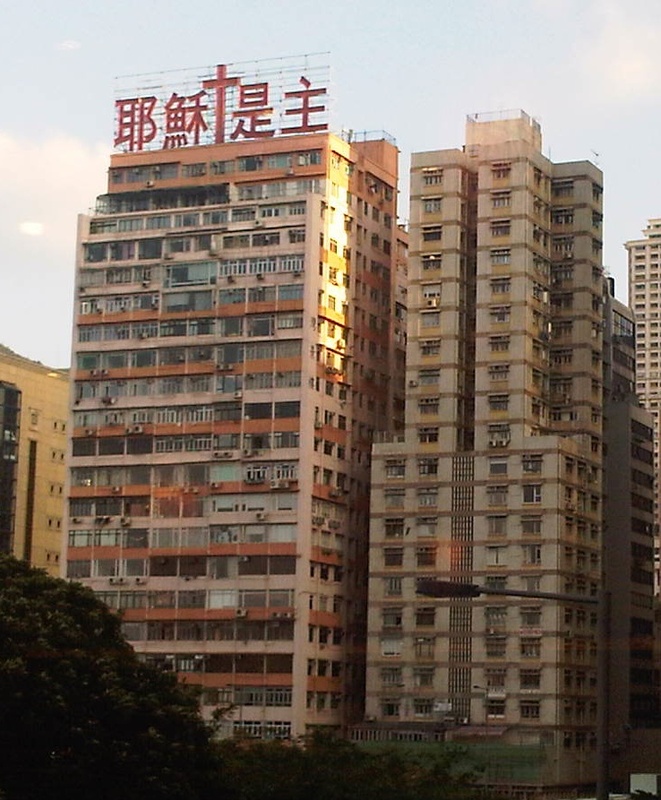 So I was sitting in a restaurant the other day, and I noticed some Chinese writing on top of a nearby building (on the right you will see the picture I took at the time). Unconsciously I found myself trying to read it, which I tend to do all the time. I can't help it. I had earlier discovered that you reach a point in your Chinese studies where you kinda pick words up along the way, you learn new words without trying. It becomes partly about discovering Mandarin, and no longer just about learning Mandarin. My eyes gravitated to 是主 which I immediately (mentally) translated as "is master"
The second character 穌 I know well, from Scotland (蘇格蘭) and soda-water (蘇打水) - but I only seemed to remember how it was pronounced , and I couldn't remember the meaning! ... so the left in all likelihood must be "Jesus"
So I deduced that the first probably sounds like "ye" - making the left half sound like "Yesu"
Of course, the next time I see those words I won't have to go through that whole process - which probably took no more than a second or two anyway. But now I know a new word - and I wasn't even trying. This has happened to me a number of times before - where I saw a word that I'd never known, and based on the context I worked out what it meant - and I've never forgotten it. 防水 (fángshuǐ): I know that 防 means defend (from the expression 防不胜防 which I knew) and 水 is water, and after seeing what they were selling, it was easy to see that every was waterproof. Yes 防水 means waterproof. 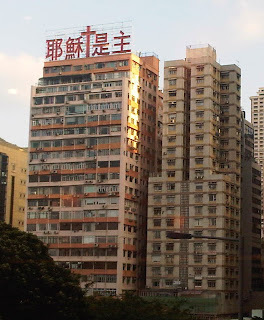 In the shopping district part of Causeway bay, Hong Kong, there are a lot of signs with 水晶 (shuǐ​jīng) written out front - meaning "water bright", which I could similarly work out meant "crystal" from the context. In a store in Taipei one I saw a sign on the wall which read "手工" (shǒu​gōng) which literally means "hand work" - and it was easy to deduce that it was indicating that the items there were hand-made. Now I know.